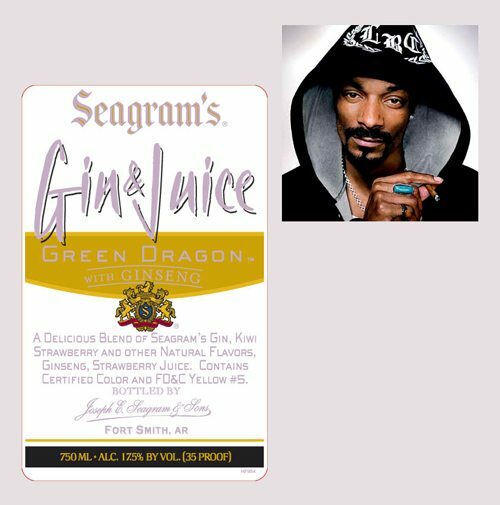 Sixteen years ago Cordazar Calvin Broadus (aka Snoop Dogg) released a little song called “Gin & Juice.” It set off a big chain of events. It helped to launch his career, garnering a 1995 Grammy nomination. It also unleashed a slew of covers, such as this country version by The Gourds (it is slightly less obscene than the original, if only because it’s a little harder to make out the words). And most to the point, it also apparently unleashed the Gin & Juice product line as above. It’s possible that Seagram got there first, but I would tend to doubt it, based on not much more than the age of the song. The song specifically refers to the Seagram and Tanqueray brands of gin. There is a whole lot in the song to horrify right-thinking persons, such as flagrant disregard for women, drug laws, mom’s wishes. But even more pernicious is the nonchalance about drinking and driving. In the original video, Snoop doesn’t quite cruise down the boulevard while sipping his gin and juice, but he might as well, as he sits behind the wheel and re-fills his cup.